2.It can Jump start Diesel Cars, Trucks, Motorcycles, Boats, ATVs, UTVs, Snowmobiles, Watercraft and more! 4.It has 4 on-board Power Ports: a 19v for laptops,---------- a 12v standard output for all 12v Accessories,----- - and TWO USB 5v Outputs for charging or powering ANY 5v USB chargeable devices. 5.It has a HI-POWER LED flashlight with 2 built-in flash patterns including an S.O.S. flashing beacon pattern. 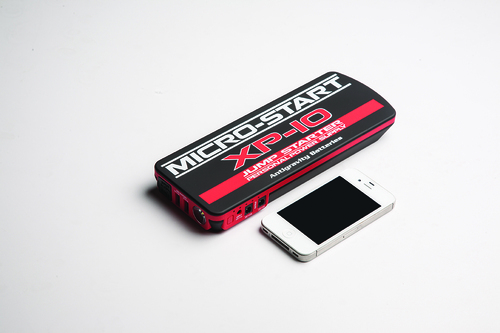 7.It has built-in over-charge and over-discharge protections for long battery life. And specialized SMART CLAMPS that protect the unit. 6.1 White Univerasal USB Cable with 4 into 1 USB Cable to fit most popular 5v USB chargeable electronics such as all Cell Phones, iPads, iReaders(Kindles), PSPs, GPS, tablet computers, and anything else using the 5V USB standard. (Apple 30 pin tip, Apple 8pin tip, Micro USB tip, Mini USB tip.